Took some random pictures in Kansas City, mostly of the Liberty Memorial, but a few other things, too. Click through for the set, as usual. The closest I've been to the memorial was the road going up to the gate. I hope to visit someday. I was hoping for trial photos where the witness is attacking the defense. But I think you're thinking of Jerry Springer. that I am. Rather tame, then? Well. I'd rather not discuss it. The one with the carin is touching. 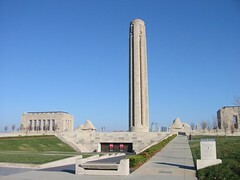 I took photos at the Liberty Memorial about 3 years ago. It is interesting comparing the places we had a similar eye and those that are different. I had no idea Kansas City had sphinxes! Sphinxes? It's the biggest phallic symbol west of the Mississippi!